:: C R E A T I V E G E N E ::: Who is This Couple? Who is this couple? Do you know? Any idea what time period this would be? The only information I have about them is what's on the card. 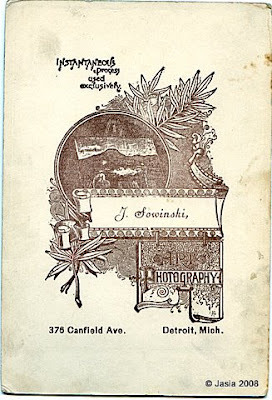 The front says, "J. Sowinski, 376 Canfield Ave., Detroit, Mich." The back says, "Instantaneous process used exclusively. 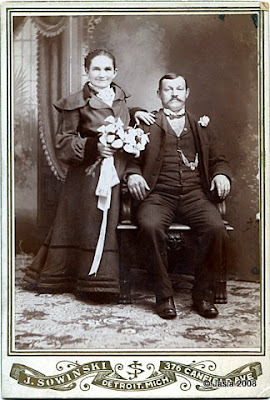 J. Sowinski, Art Photography, 376 Canfield Ave., Detroit, Mich." The woman's face looks familiar to me but that could be just because I've stared at for so long looking for a family resemblence. I was given this photo by my cousin M.E. who doesn't know who they are either. I'm guessing one or both of these people is related to my Lipa branch of the family. But then again they could be neighbors or friends of the family. Any help would be greatly appreciated! Written for the 9th Edition of the Smile for the Camera blog carnival.